I’m still awaiting the perfect post-VBS nap. You know, the nap where you sleep so hard, you wake yourself up drooling on your arm. Alas, that nap alludes me. So, I’m writing my thoughts down while they’re still fresh from Vacation Bible School. Being a VBS leader is REALLY hard, but holy work. I wanted to serve someone besides my own children and their peers for a change. I love being involved in my kids’ Biblical education, but it’s fun to get outside your comfort zone sometimes. I also didn’t know that I would be teaching third grade Sunday School this coming school year until a couple of weeks ago. So, I figured this would be good training ground. 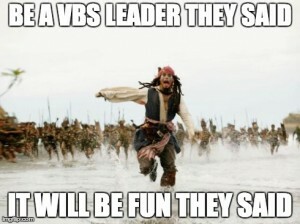 I kept waiting for someone to tell me about a training meeting because I didn’t have a clue about what to do for VBS. But that email nor a phone call ever came through. No biggie. I didn’t think it would be too hard to handle this group because I was a co-leader. My friend is an incredibly organized, gifted middle school teacher. She even listed the supplies needed for each activity in a lesson plan the day she had to leave early. I also thought it would be pretty easy because they’re older. After all, they can feed themselves, tie their own shoes and even take themselves to the bathroom. So, I just showed up. And you know what? That’s all God asks us to do. 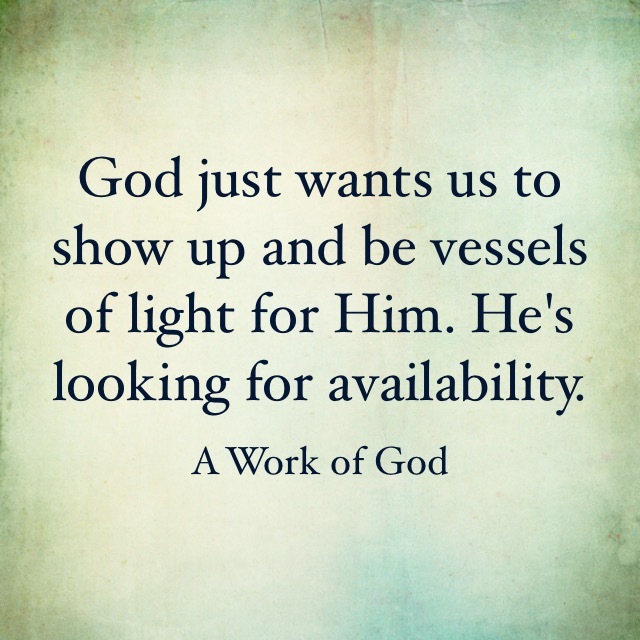 He just wants us to show up and be vessels of light for Him. He’s looking for availability. And then I got to start having some real fun. My friend said she’d only planned the first three days and she had a friends’ kids in town, a grad school paper to write and more on her plate than I did. So, I got to run the show for the last two days of the week. 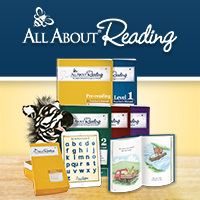 I took the guide home and got to work doing what I love – preparing to teach. I’m a student myself when I prepare to teach. I love to find just the right object lesson and story to share. I also love hearing their hearts. So, I’m grateful I got to be a vessel for Him this week, even when it didn’t go as perfectly as my notes looked in orange, fine-tipped marker. Boys are more fragile than we think. A large group of gangly third graders is hard to manage for a whole morning. You can get exasperated very quickly, but there’s a level of difficulty I wasn’t ready for – intensity en masse. I have a very intense 7-year-old. She fills the room wherever she is – her wit, her energy, her bouncing. So I’m well versed in intensity. By the end of third grade, the girls are calming down. They are less bouncy. They are sweet and kind and quite perfect actually. I know boys are boisterous and bubbling with energy. I have a man cub, after all. But he’s a different sort of boy. Not as bouncy or energetic, but quite intense. I believe intensity is often misunderstood in kids. I think I know that about boys and I really bonded with the ones who many consider troublemakers. They often just need a little more direction or to be separated from the group for a few minutes. I learned that boys are seeking approval just as much as girls, but they often don’t know how to do it in a positive way. They often get disruptive when the topic of conversation is uncomfortable or the activity is not something where they excel. My insecurities were fertile ground for connection. Want to know a secret? Boys get really uncomfortable in a room full of kids they don’t know – just like I do. Kids don’t think their good dancers, but they do it anyway. I don’t dance well, but I did it to connect with them. I actually asked them – would it be a good testimony of their faith in God to sit back and not dance? They all agreed that it’s not a good witness. Now, I believe it’s great for everyone to get uncomfortable in a positive environment from time to time. It’s how we develop social skills, how we learn to appreciate the differences in others and how we learn to be around people even when it doesn’t feel good. We learn to quiet the awkward. On our last morning, I shared how hard it is for me to get in front of a group of people to talk and how I do it anyway because it’s what God wants me to do. The kids really related to this lesson. Because it is hard to put yourself out there. 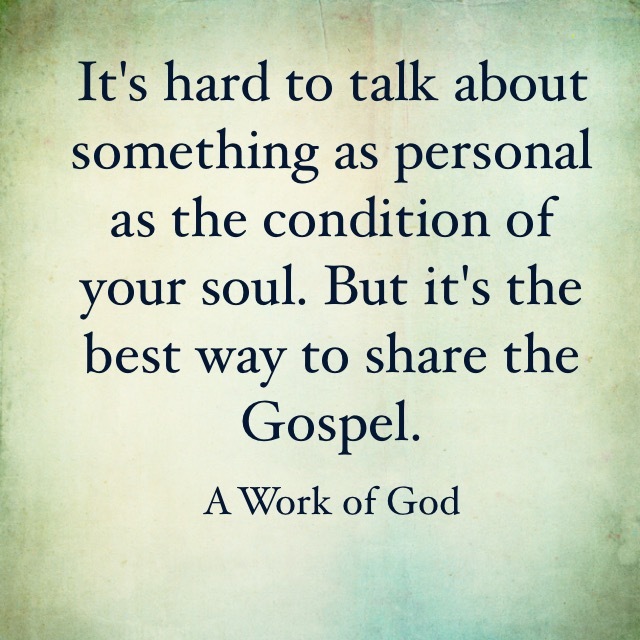 It’s hard to talk about something as personal as the condition of your soul. But it’s the best way to share the Gospel. We identify so much more with each other in the hard places. I saw the Holy Spirit in action. I saw that happen at VBS. I saw the Holy Spirit open hearts. I saw kids make decisions to accept the power of the Gospel. I used this power to conquer my fear of praying in front of others. I’ve always been much better with words on paper than in speech. I often pray in letter form, but that isn’t always practical, especially at VBS. So, I was nervous about praying for these kids. But the Holy Spirit came in and stood me up before the throne. I prayed over these children with conviction and power that was not my own. I’ve only had the experience of this enormity of prayer a few times in my life, but I know it wasn’t me doing this. 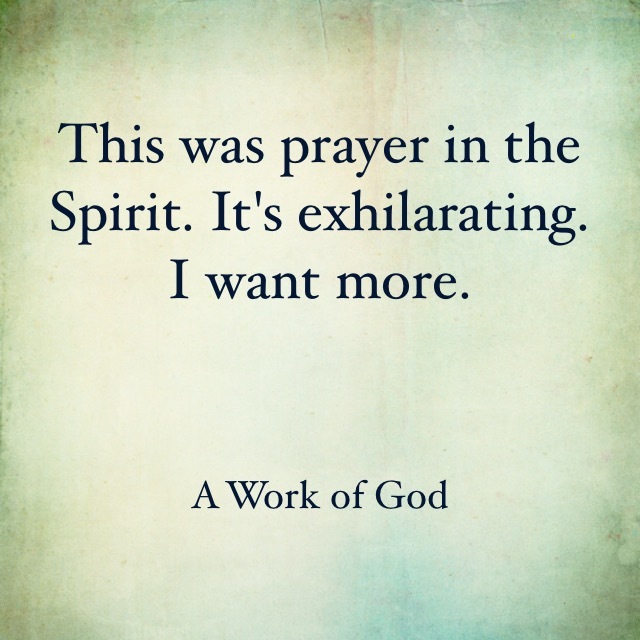 This was prayer in the Spirit. It’s exhilarating. I want more. I finally understand childlike faith. I asked the kids what their first thoughts were when they woke up. They almost all said “20 more minutes.” I don’t think they understood how peaceful that sounded. Their hearts are so open and undivided. I told them how much of a fight it was for me to quiet all the things, to just be peaceful. I got to see a few second birthdays. I told the kids that I love the Jesus Storybook Bible because of the story element. I told them I loved hearing their part of God’s big story. The best part is that I got to see several of these kids mark their place in the Book of Life. As usual, when I served I got a greater blessing than when I am served. I’m so thankful for the experience of being a witness for the life-changing love of Jesus.